THIS ARTICLE CONTAINS THE STATS, STRATEGY, AND GUIDE FOR CASTER - MEPHISTOPHELES. WE WILL UPDATE THIS AS SOON AS THE GAME COMES OUT. 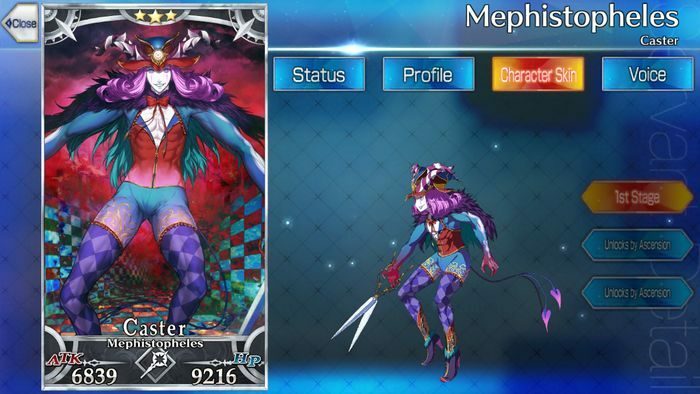 This article contains the skills, stats, strategy, and ability of Mephistopheles of the Caster class from Fate Grand Order [FGO]. Excels with Clown’s Laughter however requires finishing the Strengthening Quest first. Requires that you have a some knowledge of which enemies rely on Invincibility to work, but if you could cast this skill, it will eventually pay dividends. Thus, as a result, be sure to reinforce this Skill to raise Curse damage while reducing its Cooldown. In case an opponent manages to stack DEF buffs, Mephistopheles can still bypass them using his NP, which deals Area-of-Effect. Adding that to a Buster chain should deliver even more damage. However, the drawback is that ATK is not his strong point. Hans Christian Andersen, who shares the same type as a Caster class servant, works in tandem with Mephistopheles due to his NP which grants party buffs, which puts the party at an advantage. This functions well when paired with Mephistopheles’s Clown’s Laughter and his own NP. Iron-Willed Training is a recommended Craft Essence that minimizes damage received, which attempts to prevent the enemy from knocking out Mephistopheles as he racks up C. Stars. Together with a DEF buff from an ally, he can continue to spread Status ailments while garnering Stars. Curse A – 7 Medium Chance to reduce one enemy’s NP gauge by 1. Innocent Monster B 3 7 Gain critical stars each turn for 3 turns. Reduces own defense by 18% for 3 turns. Clown’s Laughter A+ 5 8 Prevent target enemy from applying Buffs to self (3x). Curse target enemy for 5 turns. Deals damage that ignore defense to all enemies. Chance to Curse for 500 damage for 3 turns. Mephistopheles is a demon that appears in German folklore, first becoming known in the legendary tale of Faust. The demon is known for making pacts with mortals, often offering them their deepest desires in exchange for their souls. As told in the Faust legend, the doctor Faust wagers his soul for unlimited knowledge and worldly pleasures.